The history of Oklahoma refers to the history of the state of Oklahoma and the land that the state now occupies. Areas of Oklahoma east of its panhandle were acquired in the Louisiana Purchase of 1803, while the Panhandle was not acquired until the U.S. land acquisitions following the Mexican–American War. Most of Oklahoma was set aside as Indian Territory before the Civil War. It was opened for general settlement around 1890—the "Sooners" were settlers who jumped the gun. Statehood came to the poor ranching and farming state in Oklahoma, but soon oil was discovered and new wealth poured in. Topographically, Oklahoma is situated between the Great Plains and the Ozark Plateau in the Gulf of Mexico watershed. The western part of the state is subjected to extended periods of drought and high winds which generates Dust storms. The eastern part of the state is humid subtropical climate zone. The Dry line, an imaginary line that separates moist air from an eastern body of water and dry desert air from the west, usually bisects the state and is arguably an important factor in pre-historic settlement, with agrarian tribes settling in the eastern part of the state and Hunter-gatherer tribes settling in the western part of the state. People have lived in what is now Oklahoma as long as the oldest known documented Paleo-Indian cultures in the field of archaeology/anthropology. From the earliest known projectile points of the Clovis Culture to the highly advanced Folsom and breaking off into the lesser known cultures whose artifacts and kill sites have been well documented all over the state (Dalton, Midland, HellGap, Alberta/Scottsbluff, Calf Creek), humans were present and very active in what is now today known as the State of Oklahoma. The first recorded European to enter the region was Spanish Conquistador Hernando de Soto, who encountered many cultures of Caddoan languages-speakers, including the Caddo, Wichita, Pawnee, and Kichai peoples. Spiro Mounds on the Arkansas River in eastern Oklahoma. In historic times, the Kiowa and Apache have a history that is closely related. Both were hunter gatherers who used dogs to carry their belongings as they hunted from place to place. Both migrated from Canada to the Southwest around the time Francisco Coronado explored the Southwest and introduced the horse into the environment. And both tribes adapted their cultures to include the horse. However, linguistically, they are quite different. The Apache are a Southern Athabaskan group that traditionally live on the Southern Plains of North America. 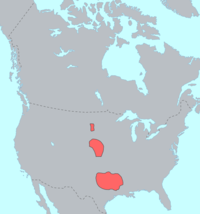 The Kiowa are part of a Tanoan group located in the Pueblos of New Mexico. The Kiowas had a well structured tribal government like most tribes on the Northern Plains. They had a yearly Sun Dance gathering and a chieftain who was considered to be the leader of the entire tribe. There were warrior societies and religious societies that made up the Kiowa society. In 1682, René-Robert Cavelier, Sieur de La Salle claimed all of the Mississippi River and its tributaries for the Kingdom of France. As such, the land that would become Oklahoma was under French control from 1682–1763 as part of the territory of Louisiana (New France). Colonization efforts primarily occurred in the northern aspects (e.g., Illinois) and the Mississippi River valley; Oklahoma would be untouched by French colonial efforts. 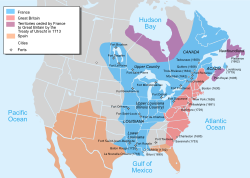 At the conclusion of the Seven Years' War and its North American counterpart, the French and Indian War, France was forced to cede the eastern part of the territory in 1763 to the British as part of the Treaty of Paris. France had already ceded the entire territory to the Kingdom of Spain in 1762 in the secret Treaty of Fontainebleau; the transfer to Spain was not publicly announced until 1764. Spain, which ceded Spanish Florida to the British in the Treaty of Paris in order to regain its colonies in Havana and Manila, did not contest British authority over the eastern part of French Louisiana as it desired the western portion that was adjacent to its colony of New Spain. Spanish colonization efforts focused on New Orleans and its surroundings, and so Oklahoma remained free from European settlement during Spanish rule. In 1800, France regained sovereignty of the western territory of Louisiana in the secret Third Treaty of San Ildefonso. But, strained by obligations in Europe, Napoleon Bonaparte decided to sell the territory to the United States. 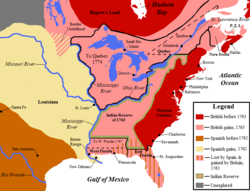 With the Louisiana Purchase in 1803, the United States acquired France's 828,000 square mile claim to the watersheds of the Mississippi River (west of the river) and Missouri River. The purchase encompassed all or part of 15 current U.S. states] (including all of Oklahoma) and parts of two Canadian provinces. 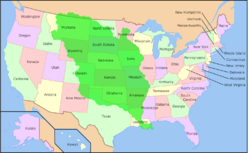 Out of the Louisiana Purchase, Louisiana Territory and Orleans Territory were organized. Orleans Territory became the state of Louisiana in 1812, and Louisiana Territory was renamed Missouri Territory to avoid confusion. The Adams–Onís Treaty of 1819 was between the United States and Spain. Spain ceded the Florida Territory to the U.S., the U.S. gave fringe areas in the West to Spain, and the boundary was established between the U.S. and New Spain. The new boundary was to be the Sabine River north from the Gulf of Mexico to the 32nd parallel north, then due north to the Red River, west along the Red River to the 100th meridian west, due north to the Arkansas River, west to its headwaters, north to the 42nd parallel north, and finally west along that parallel to the Pacific Ocean. Informally this was called the "Step Boundary", although its step-like shape was not apparent for several decades. This is because the source of the Arkansas, which was believed to be near the 42nd parallel, is actually hundreds of miles south of that latitude, a fact that was not known until John C. Frémont discovered it in the 1840s. The Adams–Onís Treaty thus delineated the southern (Red River) and primary western (100th meridian west) borders of the future state of Oklahoma. It was also by this treaty that the land comprising the Oklahoma Panhandle was separated from the rest of the future state and ceded to the Spanish government. 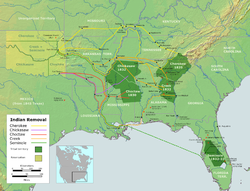 Routes to Indian Territory taken by the Five Civilized Tribes, often known as the Trail of Tears. In the early history of the United States as a nation, a challenging issue was the management of frontier settlement in the traditional lands of the Native Americans. One approach to obtain land in or near the established states was to relocate tribes to unsettled territory further west. In 1820 ( Treaty of Doak's Stand) and 1825 ( Treaty of Washington City), the Choctaw were given lands in the Arkansas Territory (including in the current state of Oklahoma) in exchange for part of their homeland, primarily in the state of Mississippi. 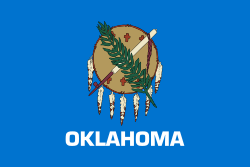 Part of what became Oklahoma was designated as the home for the relocation of the Five Civilized Tribes; it was "at the time the only available location where the Indians would not be in the way of white expansion." :140 Later the area would be referred to as Indian Country or Canadian Indian Territory. The goal was to provide ample lands for the relocation of Native Americans in the eastern states who did not wish to assimilate. In 1821, New Spain gained its independence and became the short-lived Mexican Empire, followed by the Mexican Republic in 1824. Thus Mexico was the new owner of the lands to the south and west of the U.S. Territories. Texas, a province within Mexico, declared its independence from Mexico in 1836 following the Texas Revolution. The Republic of Texas existed as a separate country from 1836 to 1845. 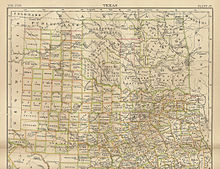 Texas was annexed as a state into the United States in 1845, and the Mexican–American War followed from 1846–1848. 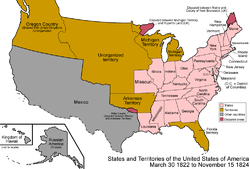 The war was concluded by the Treaty of Guadalupe Hidalgo, in which the U.S. received the lands contentiously claimed from Mexico by Texas (including the Oklahoma Panhandle), as well as lands west of the Rio Grande to the Pacific Ocean (the Mexican Cession). Statehood for Texas was politically charged, as it added another " slave state" to the Union, and the conditions for its statehood were not resolved until the Compromise of 1850. One of the conditions was that to be admitted as a slave state, Texas had to set its northern border at parallel 36°30' north as per the Missouri Compromise. In addition to relinquishing claims on lands north of this parallel, Texas also had to give up its claim to parts of what is now New Mexico east of the Rio Grande, however in exchange the U.S. assumed Texas' $10 million debt. On May 30, 1854, the Kansas and Nebraska Territories were established from the Indian Territory. The southern boundary of the Kansas Territory was set at the 37th parallel north, establishing the northern border of the future state of Oklahoma. This also resulted in an unassigned strip of land existing between Kansas's southern border and the northern border of the Texas Panhandle at 36°30' north, a neutral strip or " No Man's Land" that eventually became the Oklahoma Panhandle. In 1866 the federal government forced the tribes that had allied with the Confederacy into new Reconstruction Treaties. Most of the land in central and western Indian Territory was ceded to the government. Some of the land was given to other tribes, but the central part, the so-called Unassigned Lands, remained with the government. Another concession allowed railroads to cross Indian lands. Furthermore, the practice of slavery was outlawed. Some nations were integrated racially with their slaves, but other nations were extremely hostile to the former slaves and wanted them exiled from their territory. It was also during this time that the policy of the federal government gradually shifted from Indian removal and relocation to one of assimilation. In the 1870s, a movement began by whites and blacks wanting to settle the government lands in the Indian Territory under the Homestead Act of 1862. They referred to the Unassigned Lands as Oklahoma and to themselves as "Boomers". In 1884, in United States v. Payne, the United States District Court in Topeka, Kansas, ruled that settling on the lands ceded to the government by the Indians under the 1866 treaties was not a crime. The government at first resisted, but Congress soon enacted laws authorizing settlement. In the 1880s, early settlers of the state's very sparsely populated Panhandle region tried to form the Cimarron Territory but lost a lawsuit against the federal government. This prompted a judge in Paris, Texas, to unintentionally create a moniker for the area. "That is land that can be owned by no man", the judge said, and after that the panhandle was referred to as No Man's Land until statehood arrived decades later. Congress passed the Dawes Act, or General Allotment Act, in 1887 requiring the government to negotiate agreements with the tribes to divide Indian lands into individual holdings. Under the allotment system, tribal lands left over would be surveyed for settlement by non-Indians. Following settlement, many whites accused Republican officials of giving preferential treatment to ex-slaves in land disputes. Indian Territory (lands owned by the Five Civilized Tribes and other Indian tribes from east of the Mississippi River) and Oklahoma Territory (lands set aside to relocate Plains Indians and other Midwestern tribes, as well as the recently settled "Unassigned Lands" and the Neutral Strip) were formally constituted by Congress on May 2, 1890 in the Oklahoma Organic Act. An Organic Act is a statute used by the U.S. Congress to create organized incorporated territories in anticipation of them being admitted to the Union as state(s). The following 16 years saw Congress pass several laws whose purpose was to join Oklahoma and Indian territories into a single State of Oklahoma. Wikimedia Commons has media related to Oklahoma in the 1890s. In 1893, the government purchased the rights to settle the Cherokee Outlet, or Cherokee Strip, from the Cherokee Nation. The Cherokee Outlet was part of the lands ceded to the government in the 1866 treaty, but the Cherokees retained access to the area and had leased it to several Chicago meat-packing plants for huge cattle ranches. The Cherokee Strip was opened to settlement by land run in 1893. Also in 1893 Congress set up the Dawes Commission to negotiate agreements with each of the Five Civilized Tribes for the allotment of tribal lands to individual Indians. Finally, the Curtis Act of 1898 abolished tribal jurisdiction over all of Indian Territory. In 1902, the leaders of Indian Territory sought to become their own state, to be named Sequoyah. They held a convention in Eufaula, consisting of representatives from the Cherokee, Choctaw, Chickasaw, Muscogee (Creek), and Seminole tribes, known as the Five Civilized Tribes. They met again next year to establish a constitutional convention. The Sequoyah Constitutional Convention met in Muskogee, on August 21, 1905. General Pleasant Porter, Principal Chief of the Muscogee Creek Nation, was selected as president of the convention. The elected delegates decided that the executive officers of the Five Civilized Tribes would also be appointed as vice-presidents: William Charles Rogers, Principal Chief of the Cherokees; William H. Murray, appointed by Chickasaw Governor Douglas H. Johnston to represent the Chickasaws; Chief Green McCurtain of the Choctaws; Chief John Brown of the Seminoles; and Charles N. Haskell, selected to represent the Creeks (as General Porter had been elected President). The convention drafted the constitution, established an organizational plan for a government, outlined proposed county designations in the new state, and elected delegates to go to the United States Congress to petition for statehood. If this had happened, the Sequoyah would have been the first state to have a Native American majority population. The convention's proposals were overwhelmingly endorsed by the residents of Indian Territory in a referendum election in 1905. The U.S. government, however, reacted coolly to the idea of Indian Territory and Oklahoma Territory becoming separate states; they preferred to have them share a singular state. Cartoonist's rendering of Theodore Roosevelt's initial reaction to the Oklahoma Constitution. Murray, known for his eccentricities and political astuteness, foresaw this possibility prior to the constitutional convention. When Johnston asked Murray to represent the Chickasaw Nation during Sequoyah's attempt at statehood, Murray predicted the plan would not succeed in Washington, D.C.. He suggested that if the attempt failed, the Indian Territory should work with the Oklahoma Territory to become one state. President Theodore Roosevelt and Congress turned down the Indian Territory proposal. Seeing an opportunity for statehood, Murray and Haskell proposed another convention for the combined territories to be named Oklahoma. In 1906, the Oklahoma Enabling Act was passed by the U.S. Congress and approved by President Roosevelt. The act established several specific requirements for the proposed constitution. Using the constitution from the Sequoyah convention as a basis (and the majority) of the new state constitution, Haskell and Murray returned to Washington with the proposal for statehood. On November 16, 1907 President Theodore Roosevelt signed the proclamation establishing Oklahoma as the nation's 46th state. Gushers brought in many of Oklahoma's early oil fields—this one on February 21, 1922, near Okemah. Although the first oil well in the United States was completed July 1850 in the old Cherokee Nation near Salina, it was in the early 20th century the oil business really began to get underway. Huge pools of underground oil were discovered in places like Glenpool near Tulsa. Many whites flooded into the state to make money. Many of the "old money" elite families of Oklahoma can date their rise to this time. The prosperity of the 1920s can be seen in the surviving architecture from the period, such as the Tulsa mansion which was converted into the Philbrook Museum of Art or the art deco architecture of downtown Tulsa. In the 1920's, Democrat Kate Bernard campaigned for social justice and devoted her life to the underprivileged. She helped underpaid, unskilled workers form their own union in Oklahoma City. However, after being elected to office, those who supported her banned Bernard from the House chamber. In 1916, Bernard withdrew herself from public life and sixteen years later she passed away. For Oklahoma, the early quarter of the 20th century was politically turbulent. Many different groups had flooded into the state; "black towns", or towns made of groups of African Americans choosing to live separately from whites, sprouted all over the state, while most of the state abided by the Jim Crow laws within each individual city, racially separating people with a bias against any non-white " race". Greenwood, a neighborhood in Northern Tulsa, was known as Black Wall Street because of the vibrant business, cultural, and religious community there. The area was destroyed in the 1921 Tulsa race riot, one of the United States' deadliest race riots. While many all-black towns sprang up in the early days of Oklahoma, many have disappeared. The table below lists 13 such towns that have survived to the present. The Oklahoma Socialist Party achieved a large degree of success in this era (the small party had its highest per-capita membership in Oklahoma at this time with 12,000 dues-paying members in 1914), including the publication of dozens of party newspapers and the election of several hundred local elected officials. Much of their success came from their willingness to reach out to Black and American Indian voters (they were the only party to continue to resist Jim Crow laws), and their willingness to alter traditional Marxist ideology when it made sense to do so (the biggest changes were the party's support of widespread small-scale land ownership, and their willingness to use religion positively to preach the "Socialist gospel"). The state party also delivered presidential candidate Eugene Debs some of his highest vote counts in the nation. The party was later crushed into virtual non-existence during the "white terror" that followed the ultra-repressive environment following the Green Corn Rebellion and the World War I era paranoia against anyone who spoke against the war or capitalism. The Industrial Workers of the World tried to gain headway during this period but achieved little success. The Dust Bowl ravaged the Oklahoma Panhandle and nearby areas in the 1930s. Short-term drought and long-term poor agricultural practices led to the Dust Bowl, when massive dust storms blew away the soil from large tracts of arable land and deposited it on nearby farms or even far-distant locations. The resulting crop failures forced many small farmers to flee the state altogether. Although the most persistent dust storms primarily affected the Panhandle, much of the state experienced occasional dusters, intermittent severe drought, and occasional searing heat. Towns such as Alva, Altus, and Poteau each recorded temperatures of 120 °F (49 °C) during the epic summer of 1936. The economy was clearly recovering by 1940, as farm and cattle prices rose. So did the price of oil. Massive Federal spending on infrastructure during the Depression was also beginning to show payoffs. Even before World War II broke out, the Oklahoma industrial economy saw increased demand for its products. The Federal government created such defense-related facilities as the Oklahoma Ordnance Works near Pryor, Oklahoma and the Douglas Aircraft plant adjacent to the Tulsa Municipal Airport. Numerous air bases dotted the map of Oklahoma. (See Oklahoma World War II Army Airfields). The term " Okie" in recent years has taken on a new meaning in the past few decades, with many Oklahomans (both former and present) wearing the label as a badge of honor (as a symbol of the Okie survivor attitude). 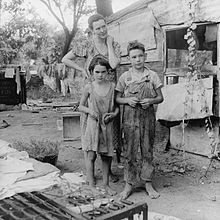 Others (mostly alive during the Dust Bowl era) still see the term negatively because they see the "Okie" migrants as quitters and transplants to the West Coast. Major trends in Oklahoma history after the Depression era included the rise again of tribal sovereignty (including the issuance of tribal automobile license plates, and the opening of tribal smoke shops, casinos, grocery stores, and other commercial enterprises), the rapid growth of suburban Oklahoma City and Tulsa, the drop in population in Western Oklahoma, the oil boom of the 1980s and the oil bust of the 1990s. In recent years, major efforts have been made by state and local leaders to revive Oklahoma's small towns and population centers, which had seen major decline following the oil bust. But Oklahoma City and Tulsa remain economically active in their effort to diversify as the state focuses more into medical research, health, finance, and manufacturing. Excluding governmental and education sectors, the largest single employers in the state tend to be in the aeronautical sector. The building of Tinker Air Force Base and the FAA's Mike Monroney Aeronautical Center in Oklahoma City, and American Airlines Engineering center, Maintenance Facility and Data Center in Tulsa provide the state with a comparative advantage in the Aeronautical sector of the economy. AAR Corporation has operations in both Oklahoma City and Tulsa, and The Boeing Company and Pratt & Whitney are building a regional presence next to Tinker AFB. The state has a significant military ( Air Force) presence with bases in Enid, Oklahoma ( Vance Air Force Base) and Altus, Oklahoma ( Altus Air Force Base), in addition to Tinker AFB in Oklahoma City. Additionally, Tinker houses the Navy's Strategic Communications Wing One. For Aeronautical education and training, Tulsa hosts the Spartan College of Aeronautics and Technology that offers training in aviation and aircraft maintenance. Oklahoma University and Oklahoma State University both offer aviation programs. The FAA's Academy is responsible for training Air Traffic Controllers. The oil and natural gas industry has historically been a dominant factor in the state's economy, second only to agriculture. The Tulsa Metropolitan Area has been home to more traditional oil companies such as ONEOK, Williams Companies, Helmerich & Payne, Magellan Midstream Partners with significant presence from ConocoPhillips. Oklahoma City is home to energy companies such as Devon Energy, Chesapeake Energy, OGE Energy, SandRidge Energy, Continental Resources. Duncan, Oklahoma is the birthplace of Halliburton Corporation. Significant research and education is done in the field by the Oklahoma University's Mewbourne College of Earth and Energy. The state has a surprisingly large concentration of companies that manufacture products that heat and cool buildings ( HVAC). Among the companies in Tulsa are AAON (the former John Zink Company). In Oklahoma City are International Environmental, ClimateMaster, and Climate Control (subsidiaries of LSB Industries). Also, Governair and Temptrol (subsidiaries of CES Group) and York Unitary division of Johnson Controls have a major presence in the Oklahoma City metro. Also, Oklahoma State University has a major research effort in developing the Geothermal heat pump, and is headquarters for the International Ground Source Heat Pump Association. Oklahoma State University–Okmulgee is known in the industry for its Air Conditioning Technology programs. On April 19, 1995, in the Oklahoma City bombing, Gulf War veteran Timothy McVeigh bombed the Alfred P. Murrah Federal Building, killing 168 people, including 19 children. Timothy McVeigh and Terry Nichols were the convicted perpetrators of the attack, although many believe others were involved. Timothy McVeigh was later sentenced to death by lethal injection, while his partner, Terry Nichols, who was convicted of 161 counts of first degree murder received life in prison without the possibility of parole. It is said that McVeigh stayed at the El Siesta motel, a small town motel on US 64 in Vian, Oklahoma. Castro, J. Justin, "Amazing Grace: The Influence of Christianity in Nineteenth-Century Oklahoma Ozark Music and Society", Chronicles of Oklahoma, (Winter 2008–2009), 86#4 pp 446–68. Lowitt, Richard, "Farm Crisis in Oklahoma, Part 1", Chronicles of Oklahoma, 89 (Fall 2011), 338–63. Smith, Michael M., "Latinos in Oklahoma: A History of Four and a Half Centuries", Chronicles of Oklahoma, 87 (Summer 2009), 186–223. ^ W. David Baird; Danney Goble (2011). Oklahoma: A History: A History. University of Oklahoma Press. p. xii. ISBN 9780806182957. ^ "A Tapestry of Time and Terrain". USGS. April 17, 2003. Archived from the original on May 15, 2006. Retrieved July 31, 2007. ^ "Caddo Fundamentals: Mississippi World. Texas Beyond History. University of Texas at Austin, College of Liberal Arts". Retrieved November 3, 2016. ^ a b "Tejas-Caddo Fundamentals-Caddo Timeline". Retrieved November 3, 2016. ^ Schlesier, Karl H. Plains Indians, 500-1500 AD: The Archaeological Past of Historic Groups. Norman: University of Oklahoma Press, 1994: 347–348. ^ Drass RR & TG Baugh (1997), The Wheeler Phase and cultural continuity in the Southern Plains. Plains Anthropologist 42: 183-204. ^ "Plateaus and Canyonlands: Kiowa. Texas Beyond History. University of Texas at Austin, College of Liberal Arts". Retrieved February 12, 2012. ^ a b c d e "Indian removal". PBS. Retrieved June 6, 2006. ^ Klos, George (1995). "Blacks and the SeminolexRemoval Debate, 1821–1835". In Colburn, David R.; Landers, Jane L. (eds.). The African American Heritage of Florida. University Press of Florida. pp. 128–156. ISBN 0813013321. ^ Baird, David (1973). "The Choctaws Meet the Americans, 1783 to 1843". The Choctaw People. United States: Indian Tribal Series. p. 36. Library of Congress 73-80708. ^ "Treaty with the Seminole, 1866". Indian Affairs: Laws and Treaties Volume II, Treaties. Oklahoma State University. Retrieved June 8, 2006. ^ "Treaty with the Creek, 1866". Indian Affairs: Laws and Treaties Volume II, Treaties. Oklahoma State University. Retrieved June 8, 2006. ^ "Unassigned Lands". Oklahoma Historical Society. Archived from the original on 2005-12-19. Retrieved June 8, 2006. ^ "Elias Boudinot 1879 Map of Indian Territory". Tulsa Genealogical Society. Archived from the original on 2005-12-13. Retrieved June 9, 2006. ^ And Still the Waters Run: The Betrayal of the Five Civilized Tribes (Princeton: Princeton University Press, 1940; new edition, Norman: University of Oklahoma Press, 1984), ISBN 0-691-04615-8. ^ Dianna Everett. "Enabling Act (1906)." Encyclopedia of Oklahoma History and Culture. Retrieved January 10, 2012. ^ Baird, W. David; Goble, Danney (2008). Oklahoma, A History. Oklahoma: University of Oklahoma Press, Norman. pp. 177–178. ISBN 9780806139104. ^ Ryan Hall, "Struggle and Survival in Sallisaw: Revisiting John Steinbeck's Oklahoma", Agricultural History (2012) 86#3 pp 33-56. ^ "What is IGSHPA?". Igshpa.okstate.edu. Retrieved February 24, 2011.